I Saw the U.S. Hand Iraq Over to the Iranians. Is the Whole Region Next? The United States had an opportunity to make sure that Sunnis and Shias were equally represented in the Iraqi Security Forces. So why did American generals allow Iranian proxies to take over? It now seems clear that, on the issue of nuclear weapons, Iran has the U.S. where it wants it. Put simply, Iran wants a favorable deal and thinks it can get one. Mainly because it knows that the U.S. fears that any further demands will sabotage a deal, and therefore will not do a thing to jeopardize Iran’s “strategic patience” on the issue. But the U.S. is not only stumbling toward Iran on the issue of nuclear weapons. It is doing the same in Iraq, where the U.S. is acquiescing to Iranian influence and accepting Iranian dominance over the Iraqi government and many of the armed militias active in the country. After so many years of American investment in trying to build a stable Iraq, the United States has effectively enabled an Iranian takeover of the country. I know, because I was there and saw it with my own eyes. That the Obama administration is not opposing the rising influence of Iran, as the White House prepares a historic deal to leave Iran with nuclear weapons just beyond its fingertips, is especially alarming, and a recipe for increasing regional conflict. In part, this U.S. elevation of Iran’s regional role is due to the rise of ISIS, which has pushed Iraq and Iran together. This is not an unnatural alliance. ISIS is a threat to both nations, which share a border and a sectarian interest—Shia Islam. From Iran’s perspective, why shouldn’t it ensure that its proxies in Iraq are fighting the ISIS threat and, while they’re at it, undermining the power of Iraq’s Sunni minority? Is this a positive development from an American perspective? Indeed, Iran appears to believe that the U.S. is essentially standing behind them on the ISIS issue. This, in turn, is seen as a tacit endorsement of Iranian influence in Iraq. In fact, recent statements from key U.S. officials on Iran’s ostensibly constructive role in the fight against ISIS have been interpreted as a green light for Iran to increase its sphere of influence in Iraq. As a result, what was once rumored to be true is now out in the open: Shia militias are commanded by the elite Iranian Revolutionary Guards-Quds Force. Shia militias that once targeted and killed U.S. and other coalition members now populate the ranks of Iraq’s paramilitary Popular Mobilization Units. Shia militias and their Iranian handlers are operating with impunity for the first time; not only against ISIS, but also against their Sunni enemies in general. As a result, Iran and its proxies now believe that the U.S. views them as a necessary evil on the battlefield and legitimate partners in the Iraqi government. The United States has effectively enabled an Iranian takeover of Iraq. I know, because I was there and saw it with my own eyes. This has given Iran and its Shia proxies enormous influence over Iraqi politics. Recent statements from Prime Minister Haider al-Abadi, for example, promise a more inclusive government, endorsing more Sunni involvement in government ministries and Iraqi security forces. To accomplish this, however, al-Abadi must get the approval of the Shia political parties, which means he needs to get the approval of Iran. In effect, then, Iran now has veto power over Iraqi government policies. Iran is also cementing its influence over the Iraqi military. Through its Quds Force advisers, it is now in a position to direct the mobilization of Shia militias and their eventual integration into Iraq’s security forces, thus shaping the country’s military and intelligence operations. Having witnessed this jarring turn of events, it is important to point out that this is not simply an Iraqi issue. It is a regional issue. The Iranian government believes that the U.S. wants a nuclear deal so badly that it will tacitly approve Iran’s activities throughout the Middle East—including in Syria and Yemen—by downplaying Iranian influence or ignoring it altogether. At the same time, Iraqi politicians cite the slow pace of America’s “strategic patience” as a reason to welcome Iranian support. But support comes with a price, and it is a price that will be paid not only by Iraq, but also the U.S. itself. I saw the rise of Iranian power firsthand. From 2005-2006, I was in the Iraqi city of Mosul, embedded with the Kurdish Peshmerga militia, which was fighting a Sunni insurgency in the area. At the time, I was unaware of the growing Iranian influence over the sprawling capital of Baghdad. I didn’t know that the Iranian-backed Badr Corps and the Mahdi Army—also known as Jayshal-Mahdi (JAM)—were involved in the ethno-sectarian cleansing of Sunni areas of Baghdad through intimidation and extra-judicial killings. And I didn’t realize that the war to prevent Saddam Hussein’s Ba’athist party from returning to power would increase Iran’s influence over the Iraqi government and various Shia militias. By 2006, however, I was fairly confident that U.S. efforts in Iraq were succeeding, because I had seen success in Mosul. The Peshmerga units, Sunni ISF and police, and their U.S. counterparts made Mosul an example of “what right looks like.” But I got a slap in the face when confronted with the deteriorating security situation brought on by the sectarian bloodletting between Sunnis and the Shia militias operating along the sectarian fault lines of Baghdad, Diyala, and Sallahudin Provinces. Much of this violence was driven by Iran. Indeed, Iranian influence ran rampant during the U.S. campaign in Iraq, despite our best efforts to curb it. Iran grew and fostered relationships with anti-Ba’athist Shia political parties and their militant wings, which then found refuge in Iran, as well as financing and training from Iran’s Quds force. Those relationships paid off when these parties took charge of Iraq’s key ministries and government positions. The Badr Corps entrenched itself in the Ministry of Defense (MOD) and the Ministry of the Interior (MOI), and flooded the officer corps of the ISF. JAM, led by the Shia Islamist Muqtada al-Sadr and his Office of Muqtada Sadr (OMS), populated the rank-and-file of Iraq’s security forces, maintaining a strong presence in the impoverished Shia slums of Baghdad. This movement would increase its political influence through election victories over Shia rivals, while its leader remained in Iran due to fears of being targeted by the U.S.-led coalition. American advisors embedded with the ISF reported to their superiors that Shia militia infiltration was increasing and, as a result, the loyalties of the Army and National Police were being tested. Flags and portraits of Shia Islamic leaders were common in the barracks, and Shia soldiers would often express loyalty to Sadr over their own government. 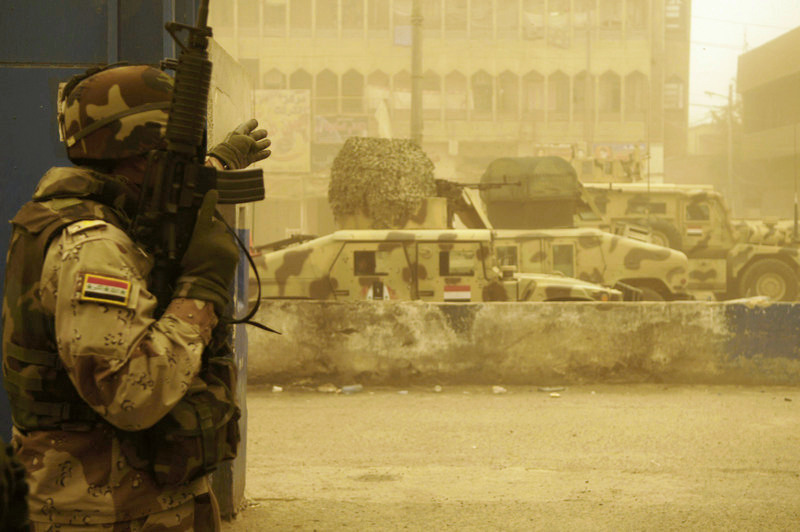 In 2006, advisors began reporting on overt infiltration of the Iraqi Security Forces, as well as the national and local police, by Shia militias. This infiltration was approved and supported by the MOI. These advisors reported, for example, that JAM banners and posters of Sadr were being openly displayed in the barracks. Reports were sent the intelligence community, which began to warn about the increasing infiltration. Both Sunni MOD Chief Abdul Qadir al-Mufriji and Shia MOI Director Jawad Bolani were unable to stop this process. The major decisions were being made by deputies who were beholden to the Shia political parties and their militias, who had approval from then-Prime Minister Nouri al-Maliki to continue their mission. This infiltration proved disastrous for the Sunnis. At the height of sectarian violence in 2006, the infiltrated units used heavy-handed tactics and worked in concert with Shia militias to conduct extra-judicial killings and ethnic cleansing in Baghdad. Secret prisons like the Jadira Bunker were set up, in which Sunnis were imprisoned and intelligence officers working for Shia militias would extract actionable intelligence through forced confessions and torture. Those running these prisons were linked to JAM and the Badr Corps. 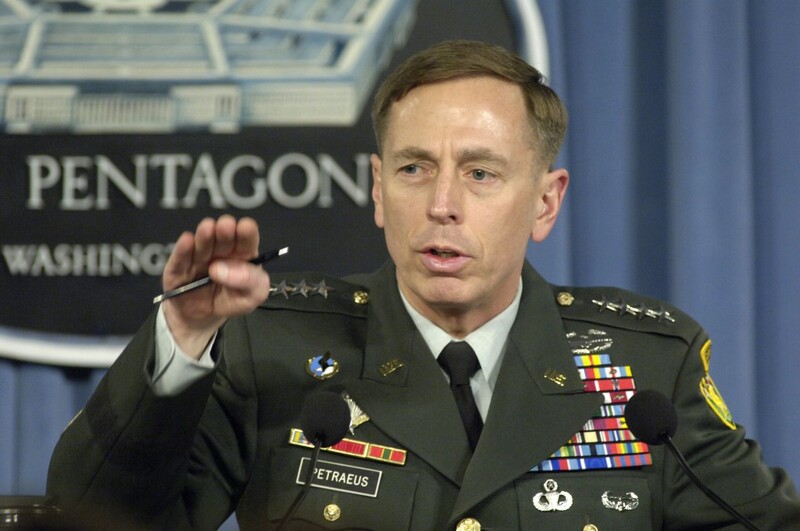 Nonetheless, General David Petraeus had some success in reaching a balance between Sunni and Shia when he was head of Multi-National Force-Iraq (MNF-I). When he left in 2005, he left behind Iraqi army divisions in and around Baghdad that had a 55-45 percent ratio of Shia to Sunni. Before Petraeus took command of MNF-I in 2007, I had the opportunity to brief him on the changing sectarian make-up of the ISF under his predecessor—General Martin Dempsey. The divisions in and around Baghdad were now over 90 percent Shia and mostly militia-affiliated. Petraeus was shocked. This shift in the sectarian makeup of the security forces was the result of a 2006-2007 purge of Sunni commanders, leaving a sectarian military force that saw few distinctions between any Sunni man of military age and the Sunni insurgency. Extra-judicial killings in Baghdad skyrocketed, with somewhere between 25-50 percent of prisoners being summarily executed, and bound Sunni men dumped around Baghdad in an attempt to terrify Sunnis out of supporting al-Qaeda in Iraq (AQI) and its affiliates. General Dempsey was in charge while this process was taking place. 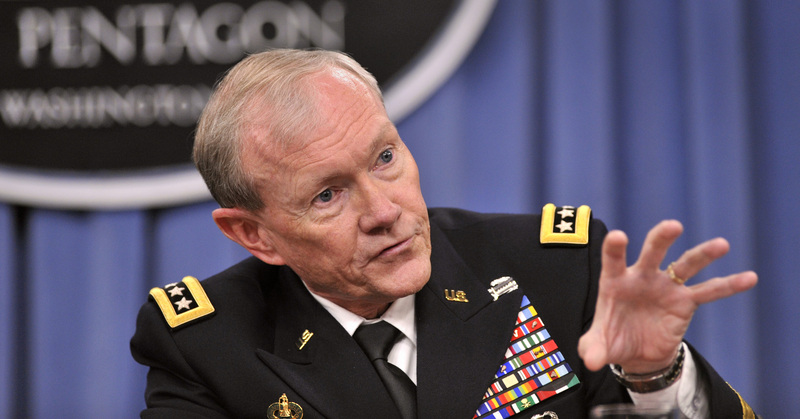 Asked about it by advisors and analysts, Dempsey replied, “I make no distinction between Shia and Sunnis. I only see them as Iraqis.” This was a noble position to take, and would have been correct if the rule of law had been in place and militia membership seen as a disqualification for service. But there was no rule of law, and the Sunnis did not share Dempsey’s views. This misunderstanding came at a high price. The purged and executed Sunni officers were the exact Iraqis we needed—those who were willing to fight both AQI and Shia militias at great personal risk. Now, they were targeted and killed by both of them. I then asked why U.S. and Iraqi units weren’t conducting aggressive cordon and search activities in Sadr City, a militia-controlled area where JAM thrives. 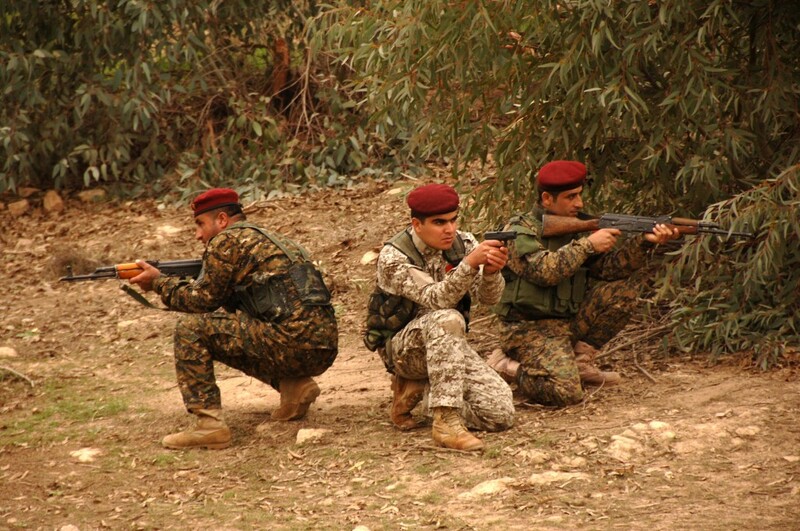 “The militias will put down their arms when the Sunni insurgency is defeated,” he said. “We don’t need to worry about them now.” When I approached Keane after the briefing and told him about the makeup of the unit he referred to, he turned to his aide and said, “Let’s go, here comes the press,” and let the elevator doors close. There were severe consequences to this mistaken policy. Iranian-backed Shia militias changed the demographics of Baghdad by targeting and killing charismatic Sunni leaders throughout the city. Sunni men of military age were rounded up and executed, with one left alive to tell the story to other Sunnis. These extra-judicial killings were often conducted by uniformed security forces with vehicles from the ministries of health and transportation. These ministries were headed by members of the Badr Corps, the Islamic Supreme Council of Iraq, and the OMS—all militant Shia groups. In effect, American fear of a Ba’athist return to power allowed Iran to become the guarantor that Baghdad would remain in Shia hands—or, more accurately, Shia who were friendly toward Iran. There was little we could do to stop this process. I was part of several efforts to curb sectarian violence and Iranian influence in Iraq. At one point, I was tasked with identifying sectarian Shia figures in the government’s security and intelligence apparatus. We developed a list of the top 50 sectarian actors in Iraq and soon realized that removing them from their positions would essentially require the overthrow of the Iraqi government. American influence in Iraq and its ability to curb Iranian influence began to wane in 2010, when the U.S. ceded its leverage in favor of “smart power,” believing that reasonable Iraqi minds would prevail. While the U.S. watched, Iran pressured Maliki not to sign the 2011 Status of Forces Agreement with the U.S., which resulted in the withdrawal of American forces, and backed his sectarian agenda of sidelining and arresting political rivals. The truth is that the U.S. was the only player in Iraq that treated it as a sovereign entity and did not interfere with Maliki’s decisions to marginalize and remove political rivals, politicize the ISF by replacing effective commanders with Maliki loyalists, and renege on his promises to integrate the anti-AQI Sunni Awakening movement—the so-called Sons of Iraq—into the ministries and security forces. There is little reason to think this situation will change. Iran’s strategic goals and dominant position, orchestrated by Quds commander Qassem Soleimani, will ensure that any Iraqi prime minister must act in accordance with Tehran’s core interests. And Iran is, unquestionably, a reliable ally, as its steadfast support for Syrian dictator Bashar al-Assad has proven. While Iran has made statements about supporting an Iraqi government that includes Sunni and Kurdish politicians, this is mere window dressing. The reality is that Tehran will not permit the steps necessary for fundamental constitutional reform, power-sharing, and checks on the prime minister’s control over the security forces and intelligence apparatus. Iran sees any such reforms as limitations on its influence, and it will never allow that to happen. By the time of the American withdrawal, we were very aware of Iran’s influence and its destructive consequences. We knew, among many other things, that the Iranians were pressuring Maliki and the Shia political parties not to sign the Status of Forces Agreement; that Quds Force intelligence was generating lists of targets that included U.S. forces and Maliki’s Shia rivals; that Iran was training Shia militias to make and employ Explosively Formed Penetrators and Interim Rapid Assembly Munitions Systems to attack armored vehicles and fortified bases; that Iran trained the Shia Islamists of Asaib Ahl al-Haq to conduct precision rocket attacks against the International Zone in Baghdad, in order to exert pressure on the Iraqi government when it showed signs of independence; and that it orchestrated the kidnapping and eventual execution of five U.S. advisors in Karbala as part a failed plan to exchange them for five captured Quds Force officers. In effect, we knew and know that everything we suspected about Iran’s influence in Iraq was true. And despite this, the U.S. is giving a pass to Iran and its proxies in Iraq; at the cost of alienating the very Sunnis we need to fight ISIS—not to mention the Iraqi Kurds, who have proven to be our strongest allies. All of these minority groups are now left wondering what we are doing by allowing Iran to operate in Iraq with near-total impunity. Now, the U.S. is heading back to Iraq in order to contribute to the fight against ISIS. But the U.S. advisory effort is now faced with an Iranian-influenced and highly sectarian intelligence and security apparatus. In effect, the U.S. lost its ability to shape the Iraqi Security Forces in 2009, when our troops pulled out of Iraq’s major cities. As a result, America was unable to influence the accelerated politicization of the ISF by Shia party loyalists, and the intentional dismantling of effective Sunni security initiatives. Sectarian actors within the Maliki government, no longer constrained by the U.S., were able to operate with impunity. As a result, the U.S. must now collaborate with an ISF that is not only predominantly Shia, but one in which Shia militias are now fighting as legitimate, government-approved security forces; Iranian and militia target lists have primacy over those developed by the U.S.; and ISIS can portray America as complicit in the indiscriminate targeting of Sunnis, alienating the very people America needs to fight ISIS. To deal with this effectively, U.S. advisors must be wary of acting in concert with Shia militant groups backed by the Quds Force. They must keep Shia militias—or Shia ISF units that behave in a sectarian manner—from entering areas in which Sunni groups are starting to turn against ISIS. If these Shia forces are successfully contained, it is likely that Sunnis will resist ISIS rule. Unfortunately, at present this is not the case. Shia troops and militia are employing the same heavy-handed tactics they have in the past, blatantly targeting Sunni men of military age and thus further inflaming sectarian tensions and encouraging support for ISIS. U.S. advisors must also vet targets very carefully, in order to ensure that Sunnis are not indiscriminately targeted as ISIS sympathizers. Even more importantly, American forces must report the level of Iranian influence in Iraq in detail, so that Washington will finally begin to pay attention to the problem. If it does not, we will be seen as constraining the Sunnis from taking up arms against ISIS; and the Sunnis will see us as allies of the Shia, who—at the moment—Sunnis see as the enemy that will remain even if ISIS is defeated. The Sunnis remember all too well that they were disarmed and targeted by their Shia government even after they defeated AQI, which has now returned with a vengeance as ISIS. However, if the U.S. demonstrates—as it did in 2007—that it is an honest broker that can ensure Sunnis are not targeted by sectarian forces, then it is very probable that the Sunnis will cooperate. This would generate a Sunni force that will be more than sufficient to deal with ISIS in the same way the Sunnis did with AQI in 2007. If this is coupled with precision targeting by the ISF, aided by U.S. advisers who can work to prevent collateral damage to the Sunni population in general; and bolstered with sufficient funding to arm, recruit and pay Sunni fighters; then the momentum ISIS has enjoyed will end, and it will ultimately be defeated. More than anything, however, the U.S. must learn from its previous mistakes. It cannot bring security and stability back to Iraq if it continues to allow Iranian influence over the Iraqi government, the Shia militias, and the fight against ISIS in general. Contrary to the opinions of many observers and officials, Iran is not simply fighting ISIS; it is helping sectarian forces fight a larger war against the Sunni population of Iraq in order to maximize its power over the entire country. As a result, the U.S. cannot allow itself to be identified with the Iranian cause. If it does, then it is likely that, if ISIS is defeated, the U.S. will simply have exchanged one group of Islamic extremists for another—an Islamic State for an Islamic Republic—and end up empowering a regional actor that is dedicated to expanding its power and influence at the expense of the U.S. and its allies. 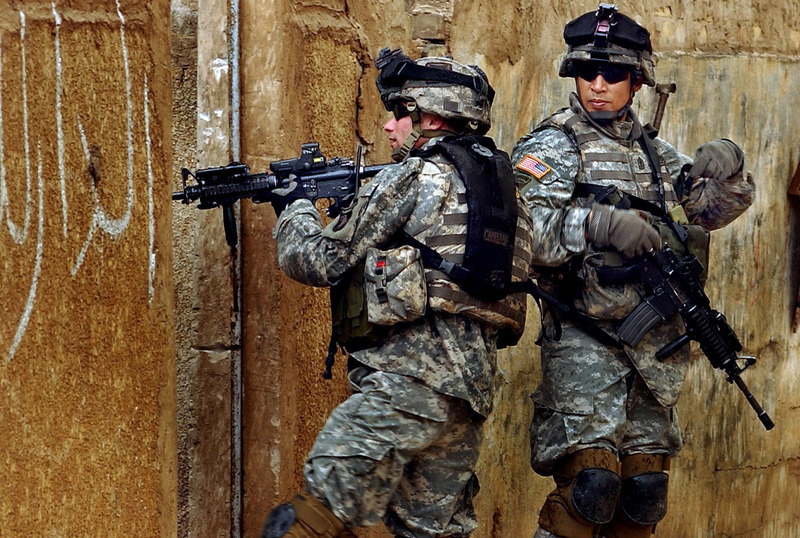 To allow ISIS to win the battle for Iraq would be a disaster. But to allow Iran to win the battle for Iraq—and the region in general—would be far worse.